NORTHEAST HOUSTON – Fire broke out at the Royale de Ville apartments last Friday morning, about 4 a.m., and destroyed 16 apartments, took the life of one man tentatively identified as Marcos Ovalle, 46, displaced 24 families, and destroyed five nearby autos. The two alarm fire was battled valiantly by Aldine Fire and Rescue department late into the morning. Royale de Ville apartments are on Richcrest Drive near Imperial Valley Drive in the Greenspoint area. Investigators and residents said that the fire appeared to start in the first floor unit at the center of the building, and spread upward to the second floor and roof. Authorities have not determined the cause of the fire. Ovalle lived in the unit where the fire seemed to start, with another person who escaped the fire. 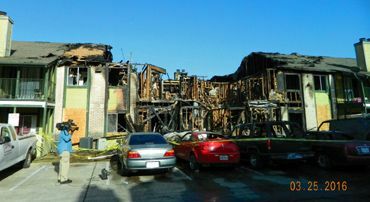 The Harris County fire marshal is investigating. Aldine Fire Chief Jackie Metcalfe said that when his department arrived, flames were already shooting through the roof, and they called for more men and equipment to help. Firement could be seen near the flames, conducting a search and rescue of residents. Residents expressed appreciation to the American Red Cross, who arrived early that morning, and provided temporary shelter, clothing, shoes, and food to displaced persons from the apartments. 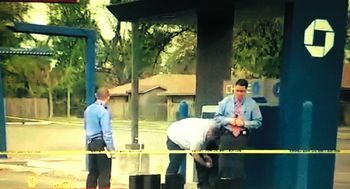 HOUSTON – An armored car guard was killed during an attemped robbery at an ATM Chase machine in nort Houston. According to Houston police, the fatal shooting happened at 5207 Airline Drive about 12 p.m. on Friday, March 18. Three men were waiting in the parking lot of the Chase bank, Houston police said. Melvin Moore, 32, an employee of Loomis armored car company, was servicing a drive-up ATM at a Chase bank on Airline Drive. While tending to the machine, an unknown male suspect exited the back seat of a black, four-door car and shot Moore. The suspect then got back in the vehicle, which fled westbound toward Highway 45 N., officials said. Moore was then transported to Ben Taub General Hospital where he died. The driver of the Loomis truck remained in the vehicle. The suspects did not get away with any cash. The shooter is described only as a black male. HOUSTON–Two robbery suspects were killed during a police involved shooting in North Houston last Thursday night, three other suspects were arrested. The fatal shooting occurred at 11314 North Freeway about 6:45 p.m. According to Houston Police, two suspects in custody, Lontay Lavelle Young, 32, and Ross Anthony White-Leonard, 25, are charged with aggravated robbery. A third suspect, Barry Jones, 23, was wounded and is currently at Memorial Hermann Hospital with non-life threatening injuries, is also facing charges. North Patrol Division Tactical Unit officers were investigating a crew of robbery suspects, which led them to a vehicle in the parking lot in front of the Affordable Furniture Store located at the 11314 North Freeway. When officers found the vehicle, they observed it was not occupied and believed the suspects were in the commission of a robbery. Officers began setting up tactical positions in the parking lot. As officers were approaching the furniture store, the suspects exited the store and began engaging the officers. Officers observed the suspects fleeing the location were armed with guns and actively engaging the officers. Officers discharged their weapons at the suspects, striking four of the five suspects. Two suspects were pronounced dead at the scene, one suspect (Jones) was transported to an area hospital and one suspect (White-Leonard) was treated on the scene for a minor grazing gunshot wound. Suspect Young was not injured. 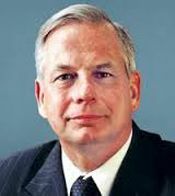 WASHINGTON – On Wednesday, March 16, 2016, Representatives Gene Green (TX-29) and Al Green (TX-09) sent a letter to Attorney General Loretta Lynch requesting an investigation by the Department of Justice into the distribution of voting machines and polling stations for the March 1, 2016 Primary Election in Harris County, Texas. Harris County residents experienced excessively long lines, waiting up to three hours to cast their vote, especially in predominantly Hispanic and African-American precincts. States and local jurisdictions are required under the Voting Rights Act of 1965 to ensure that all U.S. citizens, regardless of race or color, have an equal opportunity to participate in the political process and elect representatives of their choice. The Houston members called on the Department of Justice to investigate the unequal distribution of equipment and remedy any attempt to hinder or deny access to any American. Aldine ISD’s Central Office is relocating. After more than 50 years at the location on Aldine Westfield Road, the district’s new headquarters will be located at 2520 W.W. Thorne Drive. The new Central Office will be located in the former Baker Hughes building. The property was purchased by the district in the spring of 2015 from the district’s 2014-15 general operating budget. The new location is much larger than the building on Aldine Westfield Road. It will provide more room and allow the district to consolidate a majority of its staff in one location. Additionally, the new facility has more parking for employees and stakeholders and it is efficiently designed with modern infrastructure. The two-story building will also have a cafeteria that will be operated by the district’s Child Nutrition Services Department. The new Central Office will open on March 21 when district staff returns from spring break. A dedication ceremony and open house will be held on Tuesday, April 19 from 5-6 p.m. and is open to the public for tours of the facility. The first Board of Trustees meeting in the new building will be on April 19 at 7 p.m. The district will continue to utilize the Aldine Westfield building. Student services and Career and Technical Education will remain at that location. The Tax Office will remain at its current location, 14909 Aldine Westfield Road. All departments that are moving to the new facility will have their phone numbers roll over to the new location. HOUSTON — Traveling on the northwest side and north side of Houston will get a lot easier and more convenient as the Texas Department of Transportation has opened the newest segments of the Grand Parkway from US 290 to IH 45 as part of the completion of Segments F-1 and F-2. These segments span approximately 24 miles from US 290 to I-45 North, and include direct connectors from SH 99 eastbound to I-45 northbound, and I-45 southbound to SH 99 westbound. Improvements to these important roadways are critical to the region’s continued mobility and economic vitality. Crews on Friday (February 5) began the process of moving traffic barrels and verifying the safety of all traffic movements along the two segments of the Grand Parkway. Drivers will now have access to this newly completed roadway connecting the rapidly developing areas of Cypress, Tomball and The Woodlands. TxDOT provided one week of toll-free use on Segments F-1 and F-2 prior to tolling beginning on Monday, February 15, 2016. Thereafter, motorists can utilize a TxTAG or EZTAG to take advantage of a shorter commute. “By providing much-needed infrastructure to keep Houston’s growing population moving, TxDOT continues its commitment to supporting economic growth and development across the Lone Star State,” said Jeff Moseley, Texas Transportation Commission Vice Chairman. The SH 99 Grand Parkway has been in the planning stages since the early 1960s and the delivery of these newest segments was made possible through coordinated working relationships with Harris and Montgomery Counties. Construction on the project began in 2013 and is one of largest design-build projects TxDOT has undertaken. Segment G – the segment between I-45 and US 59 – will open in March. For more information, contact the TxDOT Houston District Public Information Office at (713) 802-5076.